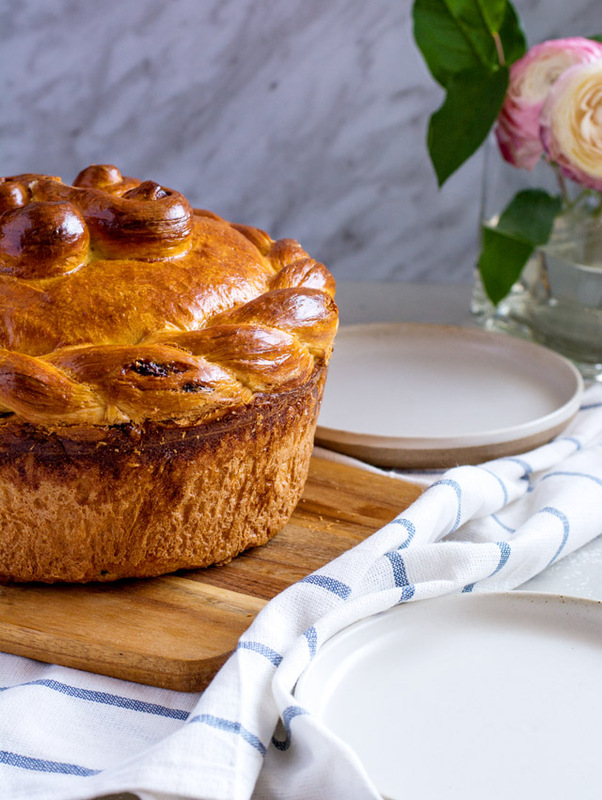 Paska is, hands-down, my favourite Easter food tradition. The usual suspects – perogies, cabbage rolls, perishke – all make an appearance, of course. But it’s the Paska that I fill up on. It’s usually force fed to me by my Baba along side a cup of tea. In all fairness, I do love the stuff (and my Baba) so it’s not entirely torturous. 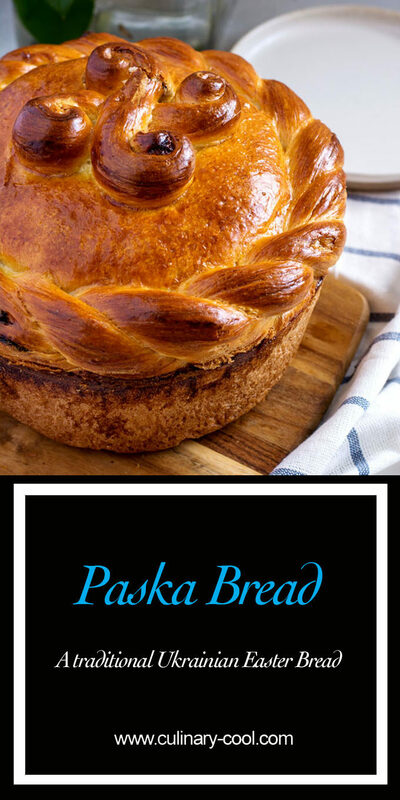 Back home in Winnipeg, and in most of Manitoba, you can find fresh baked Paska at any grocery store at Easter. Here in Saskatchewan, not so much. I may have seen it once or twice in the past, but it’s not nearly as prevalent as back home. So if I want it, I have to make it myself. 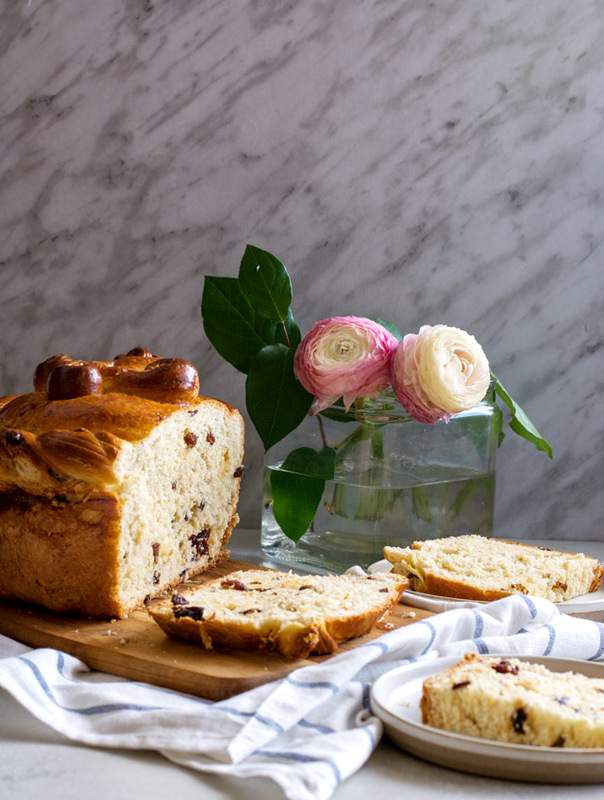 Paska is an Easter bread with Eastern European roots. 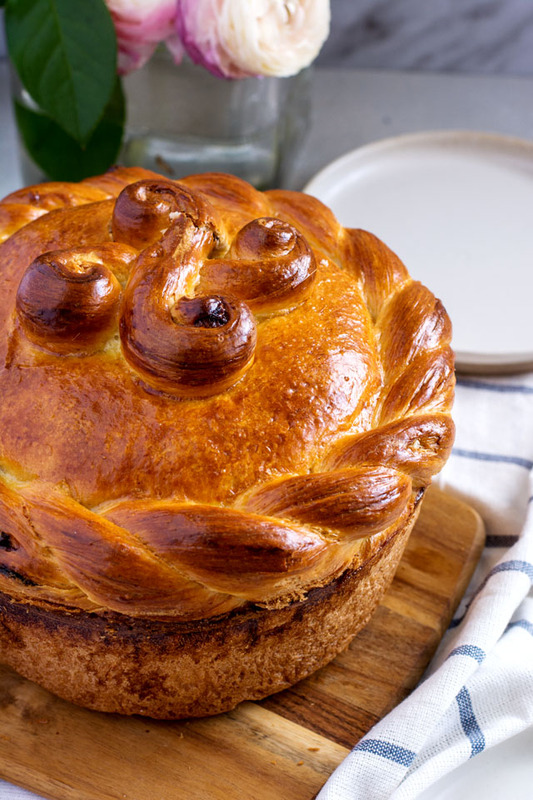 It’s made with a soft dough enriched with eggs, butter and sugar (you know, the good stuff), then formed into a round loaf and topped with ornate braids, twists and swirls. I’m fond of the addition of raisins, but it’s completely optional. The egg wash before baking is crucial if you want to achieve that beautiful, glossy browned crust – don’t skip it! Paska is best when it’s fresh out of the oven and still a touch warm. Cut a few awkwardly large slices, slather on some butter, (or in my sweet nephews case, some jam) and indulge in my favourite Easter treat. In a small saucepan, add the milk and heat over medium heat until scalded (reaches 180 degrees F). Remove from the heat. Add the raisins to the hot milk and set aside. This will allow the raisins to plump up. In a large bowl, mix together flour, sugar, yeast and salt and whisk to combine. Add in the milk, raisins, eggs and melted butter. Mix with a spoon until a rough dough is formed. Dump onto the counter and knead with your hands until a soft, cohesive dough is formed, about 5-8 minutes. Lightly oil a large bowl. Transfer the dough to the bowl and allow to rise for about 3 hours in a warm location. After 3 hours, or until the dough has doubled in size, punch it down. Cut off about 250 grams (very small handful) of dough for decorations. Form the remaining dough into a ball and place into a greased, round baking dish, about 8 inches wide and 4 inches deep. Form the remaining dough into decorations. I like to make braids, twists, and swirls. Use toothpicks to hold in place. Allow the dough to rise for about another hour. Whisk together egg and water, and brush on the risen dough. Bake for 30-35 minutes. If the top gets too brown, cover with foil. Let cool in the pan. Once it's cool enough to handle, remove from the pan. Cool completely and store in an airtight container for up to a week. **I use instant yeast, which means you don't have to proof the yeast in warm water and sugar - you just add it to your flour and move on! If you're going to use dry-active, you will need to proof it first, so you can use the warm milk with some sugar added. What a spectacular photo. My oh my. I see the love you have for Paska Bread. Love this post. 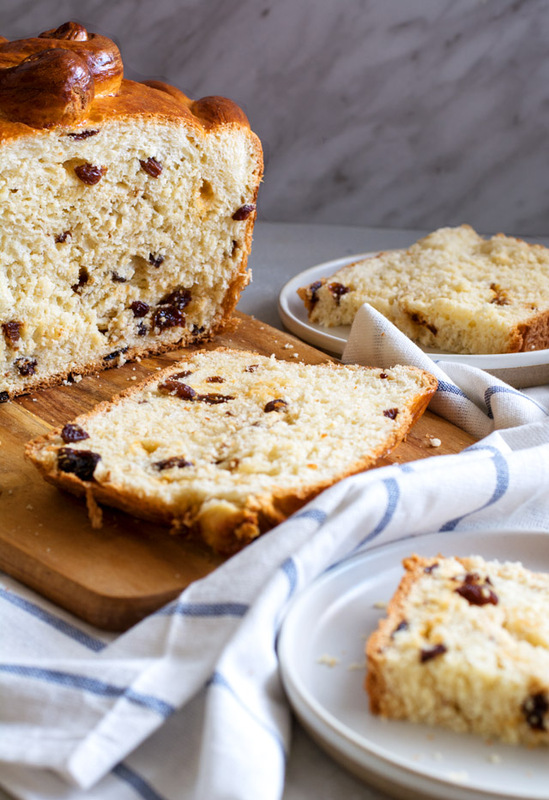 This looks very similar to a the German raisin bread (Rosinenbrot) my father makes every year! This has me all motivated to try and bake this tomorrow!